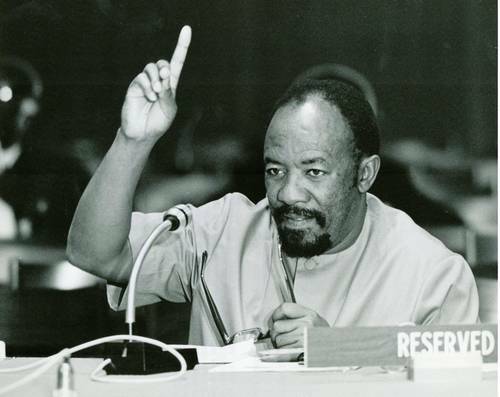 Alfred Nzo, Secretary of the African National Congress (ANC) of South Africa, addressing the United Nations Special Committee of 24 on decolonization, Lusaka, Zambia, April 20, 1972. The Special Committee held a series of meeting in Africa in April 1972 including Conakry, Guinea; Lusaka, Zambia; and Addis Ababa, Ethiopia to consider the questions of Southern Rhodesia, Namibia and the African Territories under Portuguese administration. Established by the General Assembly in 1961, the Special Committee became the focal point for the implementation of the Declaration on decolonization. The Committee (also known as the Committee of Twenty-four because of the number of members) reviews the political, economic and social situation in each of the remaining Non-Self-Governing Territories on the United Nations list. The Committee's full title is the Special Committee on the Situation with Regard to the Implementation of the Declaration on the Granting of Independence to Colonial Countries and Peoples.